So despite the fact that The Legal Genealogist keeps saying, over and over, that the admixture percentages we see in all the autosomal DNA test results are only good for cocktail party conversation, the fact is, hey, at this time of year there are a lot of cocktail parties. And, of course, a lot of admixture tools. One of ’em just got updated, and I couldn’t resist taking a look. 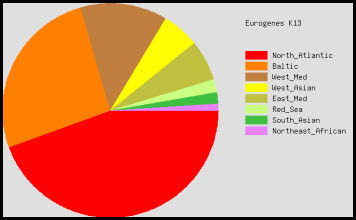 The tool is the Eurogenes K13 admixture tool; it’s accessed through my favorite third-party utility site, Gedmatch. You head over to the site, log in, choose Admixture from the Analyze Your Data options, select Eurogenes from the drop-down menu and “Admixture Proportions (with link to Oracle)” from the radio button choices, and then click on continue. Enter your kit number at the top, select Eurogenes K13 from the drop down list for calculator models and click continue again. And then you wait while it runs through 1000 iterations comparing your raw data to the data in its population samples using its algorithms. The first thing I wanted to see was how my mother’s two brothers and one sister whose kits we have at Gedmatch compare to each other. It was intriguing to see how their results are close — but not exactly the same. Then I wanted to look at a more personal comparison. The comparison between me, 50% German and 50% colonial American mutt, and my half-brother, 50% German and 50% Swedish (all four of our father’s grandparents were born in Germany and all four of his mother’s grandparents were born in Sweden). So… this admixture tool spots our German (which appears to look a lot like Dutch), and spots my brother’s Swedish (which appears to look a lot like Norwegian). There are two things I find interesting about this tool, since we’re chatting now over our cocktails. The first thing is that, unlike the recent change in the analysis by AncestryDNA (see DNA disappointment, posted 15 September 2013), this admixture calculator doesn’t seem to have any trouble finding the Germans. I get ’em, my brother gets ’em, even my mother’s siblings get ’em (and that makes sense — we have a Shew line that I expect goes back to some German Schuhs). And the other thing is how very alike these reference populations must be for the results to be coming out the way they are. German and Dutch and Danish all so very close, Southeastern and Southwestern English and Irish and Orcadian. I still want a magic wand I can wave that would put an ethnic and geographic origin stamp on every segment of my DNA. For that matter, I want a magic wand that will mark each segment with the name of the specific ancestor I inherited it from — maiden names of women included. But in the interim, it’s really fascinating — here around the Sunday cocktail table — to see that we’re really not French or German or Dutch or Danish. And so much more alike than we are different. My known ancestry is English, German, Irish, and Scottish, and there may be a Frenchman back there somewhere. DNA points to the Pyrenees (mtDNA V). I wonder if FTDNA is trying to tell me that all of my ancestors came out of the Iberian refuge and spread up the west coast of Europe? Fascinating numbers. I am Dutch going back 10 generations, and so is my mom. We both tested and in both our cases, German is the nr. 1 reference population, with Dutch a close second. I think there’s not much difference between Dutch and German, genetically speaking. What I find hilarious is that my father’s phased kit (he hasn’t tested) comes up 3% Amerindian (I’m at 1.5%). I’ve been able to trace 10 generations of his ancestors on all lines except 2 or 3 people, and they all come from within 10 miles of the house where he was born, in a village on the Dutch/German border. Definitely no Indians there! I’m sharing this because a lot of Americans get excited when they see 3% Native American and think this cannot be a statistical anomaly. But believe me, if my father can show up 3% native, it can definitely be a fluke. I suspect that Dutch and German (and probably Danish as well) will prove to be just about indistinguishable in the long run, Yvette. Now as for that Native American — some interesting recent developments suggest that the even more ancient ancestors of our Native Americans may have “fed” their DNA to Europe as well as the New World. We have more to learn there too! The Native-American ancestry in Europe most likely came from the Sami. Strange that most people forget about them. Mine are fairly close to the aunts & uncles. Interestingly, my West_Med is identical to our Aunt’s. And man… the mixed mode really wants to give you an explanation for that odd Middle East thing we keep seeing! I’m confused by the Single Population / Distance figures. What does “distance” refer to? It’s a measure of the differentiation between you and the reference populations. The higher the number, the more different you are. So whats the hightest a person can get till you should ignore it? I’m sorry I’m really new at this, and I’m tryin to find out whats in my dna. Does this also go for the Mixed mode pop? There’s no realistic way to answer this question, since it’s so heavily dependent on the quality of the reference population and the reliability of the data. Please define the area included in “ATLANTIC”, being as specific as you can. Thanks! Every admixture tool has a different definition of the areas included in a specific reference population — and the definition may change over time as the reference populations vary over time. You’d need to look at the description for each one as it is now. You are aware that this – like any other lineage DNA – uses your mother’s / father’s mother’s DNA only. Given that your relatives either all came from the same country given their closeness and/or even the same village / region. I wouldn’t be surprised if they married cousins throughout your bloodline. For a full explanation of that admixture tool, you need to ask its author, and the links are there are the admixture tool to find the blog. Can anyone help me to interpret my results somewhat? I have asked around and haven’t gotten much of a response. I know my maternal side only, and with 100 percent certainty I am 25% Irish and 25% Italian. Ancestry predicted that correctly for me, but also said I had 22% Great Britain and 15% Eastern Europe which would be from my birth father who I know little about. What would the Mediterranean groups be? Do you think that these results reflect British or E. Europe in any way? Those groups are much more likely to represent the Italian part of your ancestry. I have Shews in my family tree also. 🙂 By North Atlantic, do you know what countries are included in that outcome? What branch of the Shew family are you from? For an overview of K13 Eurogenes, see this blog post. ancestry gave my dna results as 63% british?27% irish and 7% scandinavian,on gedmatch my single population share came as irish 3.11,southwest english 3.41,west scots,3.42,orcadian,3.69 south east english 3.92 dutch 5.25 danish 5.71 north german7.04.all my ancestors on most sides come from england ,why the high irish score?i must admit i dont understand it. Please read all the posts on admixture for a better understanding — these percentages are ESTIMATES ONLY and are only truly reliable at the continental level (Europe versus Asia versus Africa, for example). thank you for your reply,your photographs are lovely,wish i was there,enjoy your holiday.kind regards carol heaps. Why does Ashkenazi show so consistently? Does that mean it is dominant? Thank you for the clarification. Thank you, Judy, for your response. I did contact him but have not received a response (yet).